Downhill from McMurdo, at the foot of the congealed lava blob on the Ross Sea, stands the New Zealand research center, Scott Base. 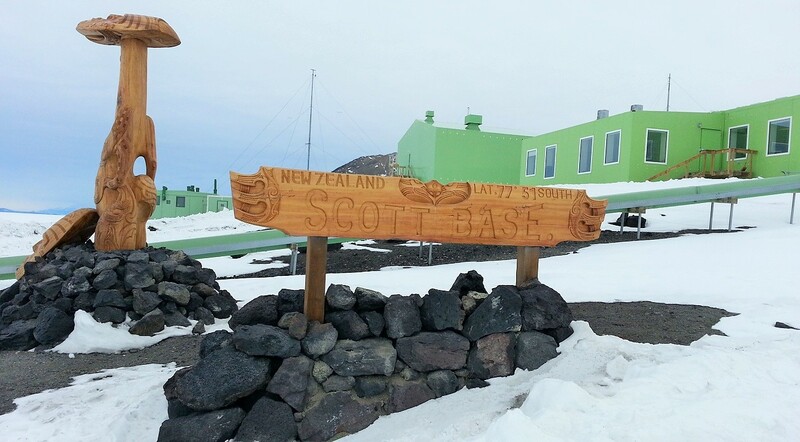 Named for the famous South Pole seeker Captain Robert Scott, Scott Base was founded in 1957 as part of the International Geophysical Year project. New Zealand plays a key role in all Antarctic missions, for flight connections and resupply. New Zealanders (often called Kiwis after their Maori-named indigenous bird) have a longstanding interest in Antarctic exploration. 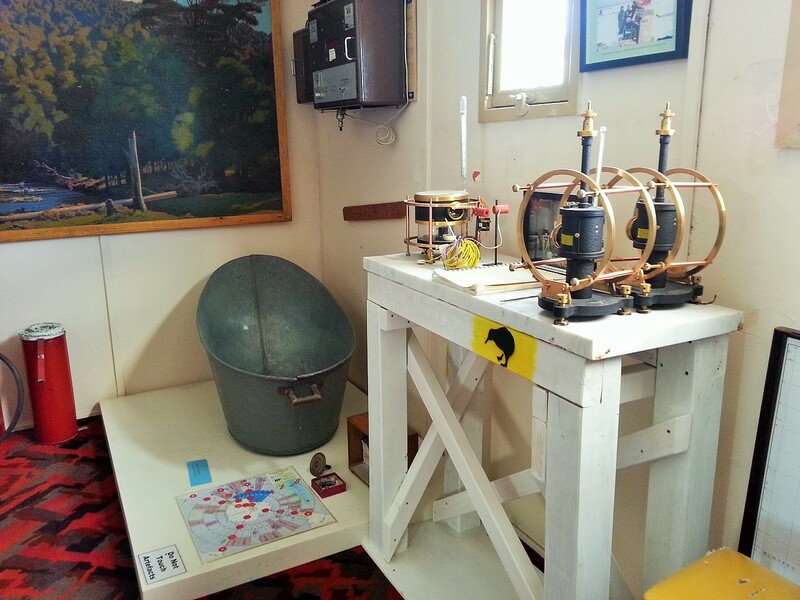 Their base conducted scientific research before research became the focus of McMurdo. Their buildings are all colored a pretty “Chelsea cucumber green.” Proud of New Zealand’s native heritage, they have a Maori statue (left) presented by a Maori delegation who came to visit. 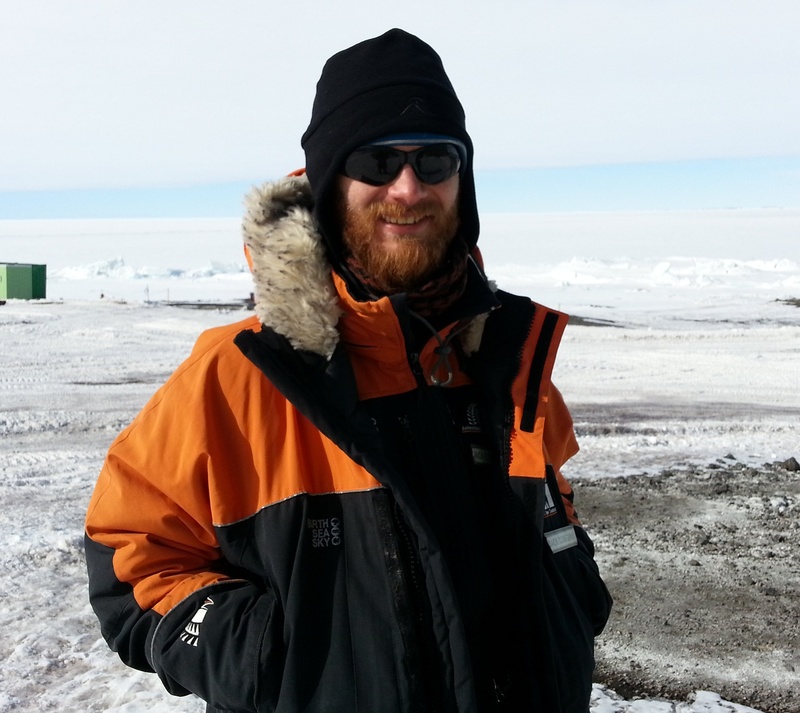 Today, Scott Base and McMurdo are heavily interdependent, but maintain distinctive identities. 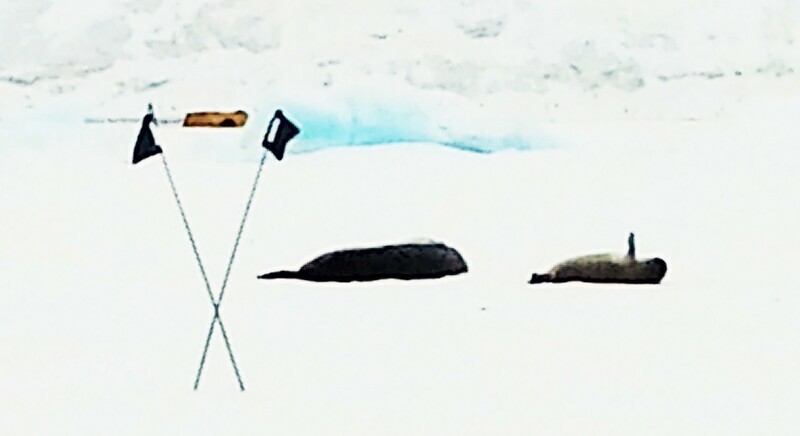 The general opinion of Scott Base is “smaller and better.” While accommodating just 85 people in the summer, they do impressive research on geophysics and seal behavior. 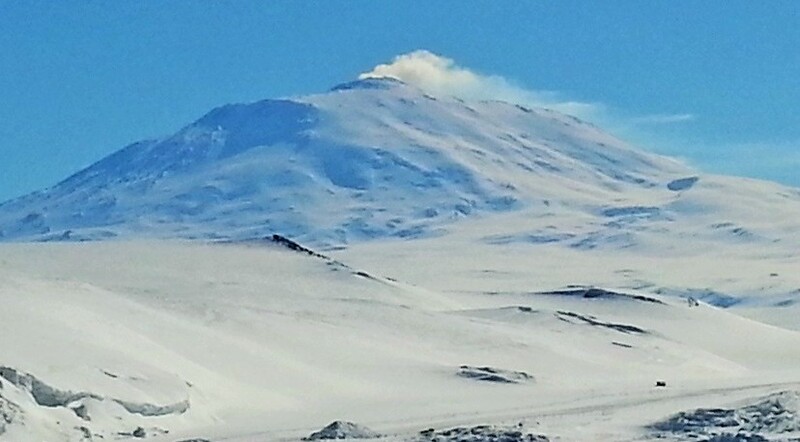 Their site has the better view, including two smoking volcanoes Mount Erebus and Mount Terror. You can see the smoke rising from each. 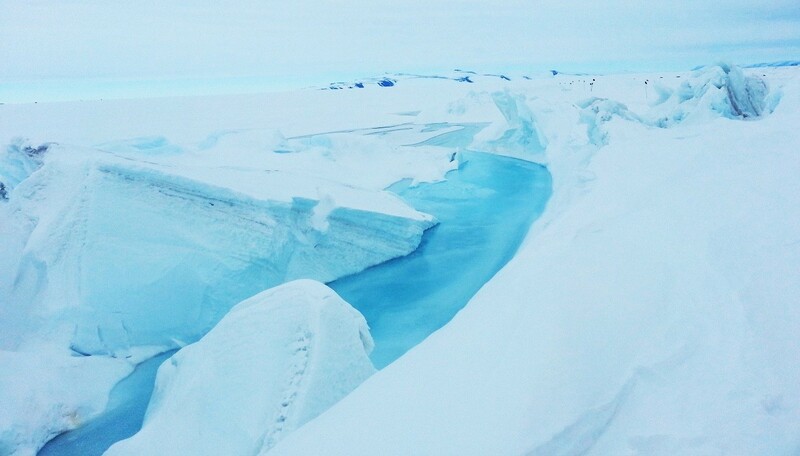 Scott Base manages the coolest tour site, the pressure ridges. Pressure ridges are the place where the sea ice meets the more permanent land-based ice, crushing it up in chunks; you can see those in the middle (above; more below). The pressure ridges make holes, which attract seals (yes, we’ll get to those below). The Kiwis, as they call themselves, have superior extreme-weather gear, orange-black parkas that are less bulky than Big Red but just as warm. 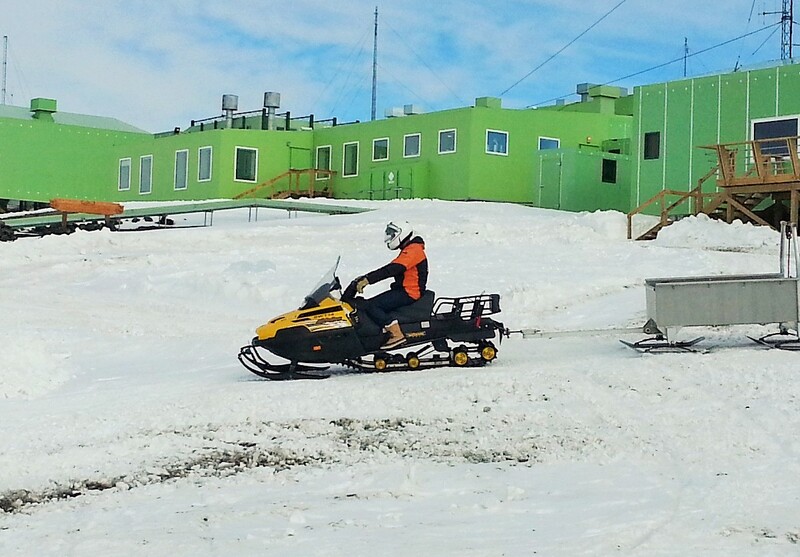 Kiwis get about on orange-black skidoos, the coolest personal vehicles we’ve seen. They have their own helipad and contribute an orange-white helo to the Dry Valley fleet. I was honored to accept an invitation for a tour from Jill, an NZ air force officer at the base. 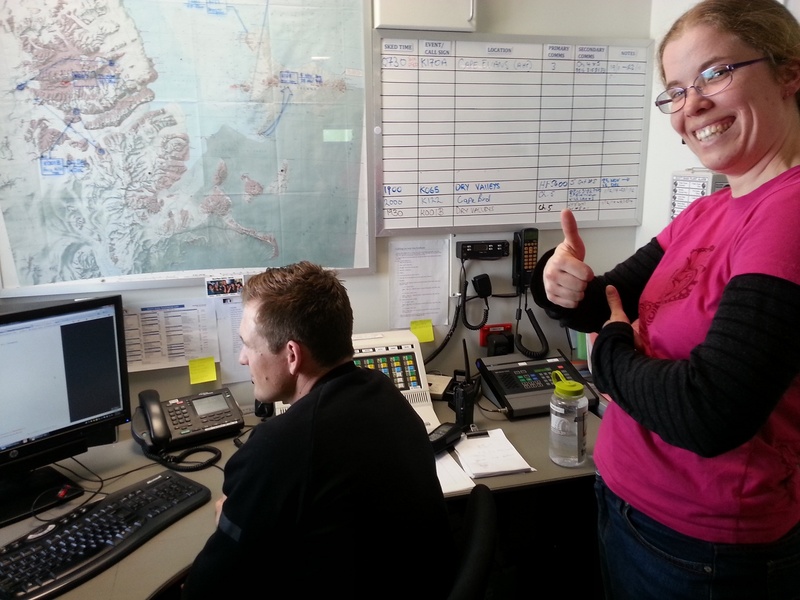 Here we are in their flight control room, run by Ben (who is navy, but Jill doesn’t mind.) Scott Base runs their own helos as well as flights from Christchurch; these are coordinated closely with McMurdo, where I met an NZ crew visiting the day before. Jill showed me the historic site of the original Scott Base building on Pram Point (named for a boat called a pram). The interior has been kept frozen in time, the way it looked back then. Here you see the original living room, with a bathtub and a board game. Today, New Zealand hosts weather researchers like Jack. Jack had just come off a helo setting up twenty weather stations on the Ross ice shelf. New Zealand is installing their own array of weather stations, to see if their data confirms the American set, and to test additional questions. In the gear supply, Amanda is sewing a sleeping bag. 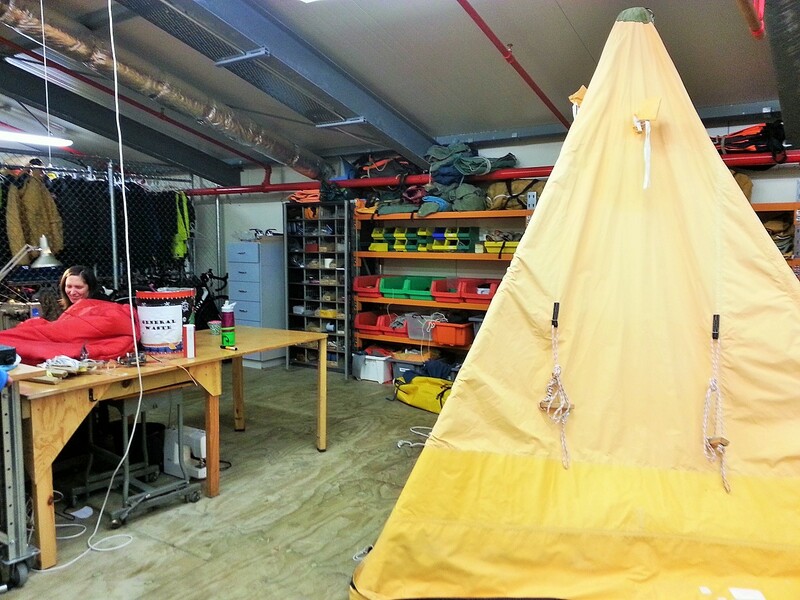 Scott Base’s gear supply center resembles that of McMurdo’s BFC—but some of the gear is quite different. Kiwis prefer the famous Scott tents. A Scott tent looks more like a teepee, includes a chimney exhaust for cooking, and houses more than one person. This makes more sense to me than the American style of one person per tent. 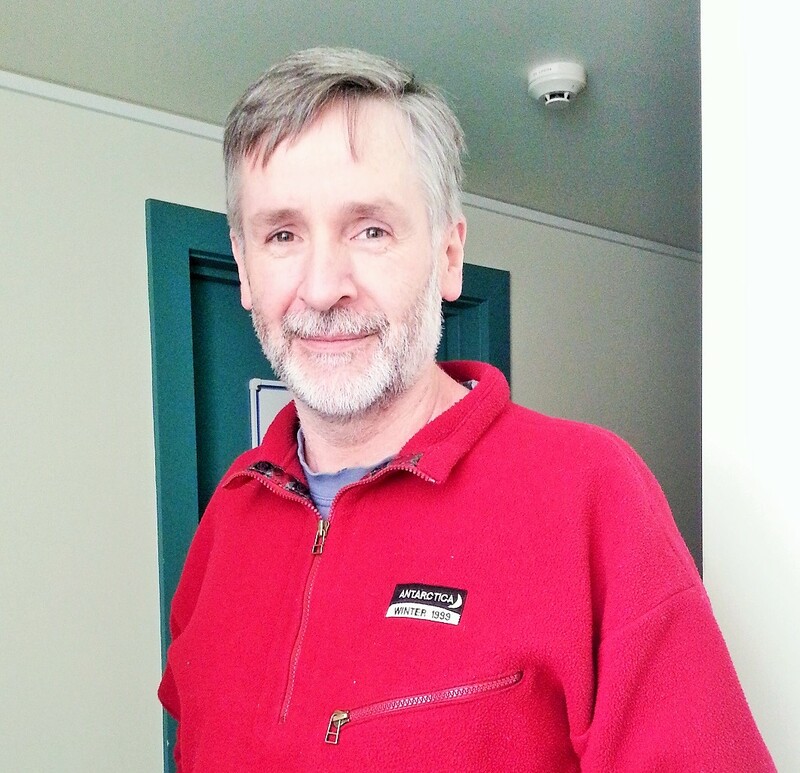 In the living quarters of Scott Base, I was introduced to Anthony Powell, director of the award-winning documentary film A Year on Ice. Powell maintains an office at Scott Base. You can see he is proud of having overwintered. Unfortunately I was too star-struck to ask questions. The Kiwis maintain the tour site for the pressure ridges. This time of year, it’s still safe to walk out on the ice, though later it melts too far in; last year, orca whales were seen here. For now, the ice is safe enough for visitors to walk with care. The Kiwis go out every day with an “alpenstock” stick to probe the ice for cracks. Then they set up flags for the tour. Green or red flags are okay, but black flags mean don’t go here because there are holes or deep cracks. Here you can see the sea ice rear up, exposing its blue underside. We walk past, close enough to touch; it’s unnerving. Our guide Lauren walks ahead, probing with her alpenstock. Uphill the windmills turn, providing most of Scott’s power. No, this is not a hole straight through the ice! Here, pools of water have melted atop the ice, forming moats around the jagged mountains. But there must be holes somewhere–since there are seals. The holes in the ice attract seals, because the animals can dive for food here without predators such as whales. And seals attract visitors with expensive cameras. The seals basically loll around for days, smelling up the neighborhood. They rest after diving hundreds of meters for food, and after fighting with each other; the snow shows red blood stains. According to law, we are not allowed to “disturb” the wildlife. But their availability for dozens of humming cameras enhances public support for protecting Antarctica. 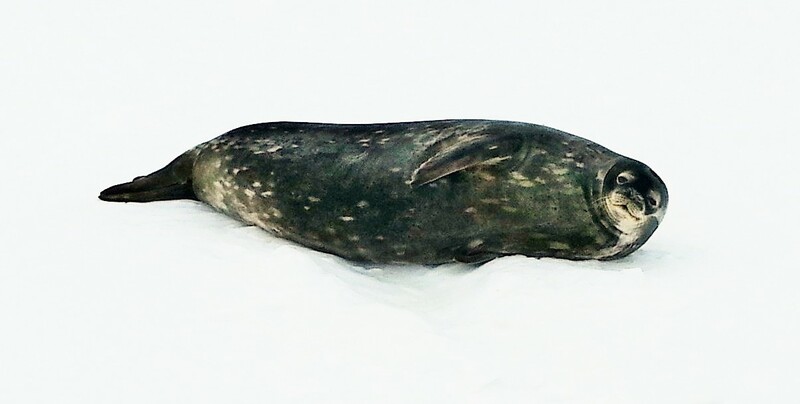 Here, a baby seal (right) extends a flipper while resting next to the mother. That’s how I feel in my tent after a long day. 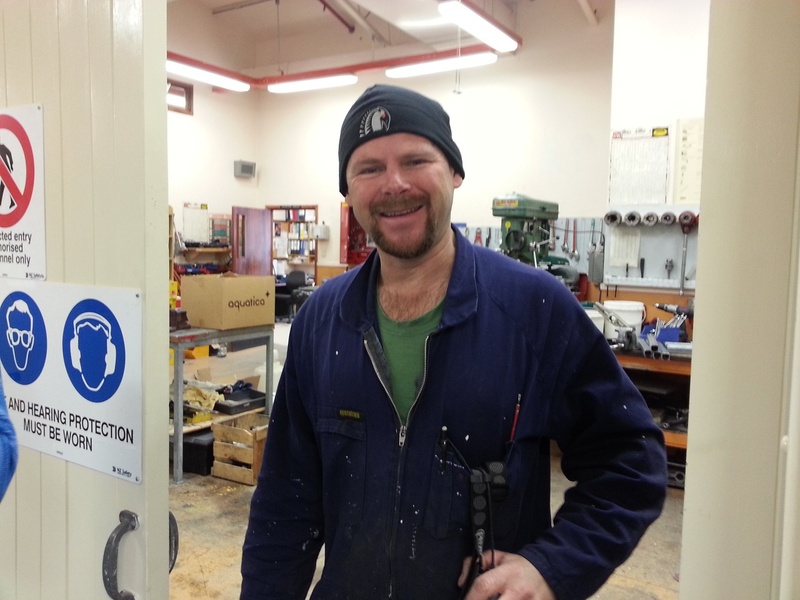 Thanks to the Kiwis for maintaining the pressure ridge tour, and for sharing their distinctive mission at Scott Base. Next: Back to the field, where lakes are upside down. Thanks, Frank, it’s good to hear from you. It does get to feeling alone out here, surrounded by rocks and microbes. 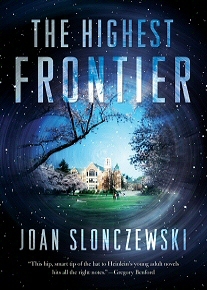 Joan: Thanks for the intro to the Kiwis. They seem quite at home down under. 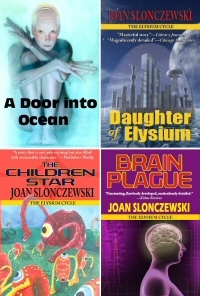 PS: I finished with my steroid treatments, now sort of convalescing. Looking forward to your return.